Within seconds of Drummer Lee Rigby's family leaving, hundreds of members of the public moved back onto the road in Woolwich to pay their their respects. Members of Drummer Lee Rigby's family visited the scene of his murder in Woolwich,today. They laid flowers at the Woolwich Barracks where the 25-year-old soldier with the Royal Regiment of Fusiliers was based, and where hundreds of floral tributes have already been left by wellwishers. The family members arrived at the place where he was killed.They hugged and comforted each other as they looked as some of the many thousands of floral tributes that have been left in memory of the soldier. They then crossed the road to look at the exact spot where he was murdered.One clutched a teddy bear, while others held baskets of flowers which they left at the scene.One woman tied a balloon with "dad" written across it.They then spent a few moments in reflection, still clutching each other. 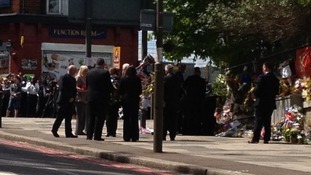 Relatives of Drummer Lee Rigby have visited the street in Woolwich, south London where the soldier died. 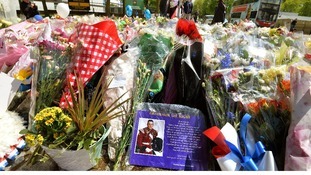 They joined hundreds of others in leaving flowers at the scene. They hugged and comforted each other as they looked as some of the many thousands of floral tributes that have been left in memory of the soldier. They then crossed the road to look at the exact spot where he was murdered. One clutched a teddy bear, while others held baskets of flowers which they left at the scene. The latest arrests came as Downing Street confirmed the launch of a new terror task force on extremism. The group, of Cabinet ministers and top police and security service officials, will focus on radical preachers who seek out potential recruits in prisons, schools, colleges and mosques. .Authorities in France are also investigating whether the murder of Drummer Rigby was linked to an attack on a French soldier, who was stabbed in the neck in a busy shopping area near Paris yesterday. The priest leading a memorial service for Drummer Lee Rigby in his home town of Middleton, Greater Manchester has told worshippers that "a bit of ourselves has died too". He described Rigby as a "man devoted to his brave profession as a soldier, but a man who was also not afraid to tell his Mum how much he loved her". Detectives have made three further arrests in connection with the brutal killing of soldier Lee Rigby. Two men, aged 24 and 28, were detained at an address in south-east London yesterday, while a 21-year-old man was arrested in the street in Charlton Lane, Greenwich, all on suspicion of conspiracy to commit murder. Police from the Counter Terrorism Command, supported by specialist firearms officers, used Tasers to detain two of them, the 21 and 28-year-old. They did not need hospital treatment. A service dedicated to Drummer Lee Rigby will take place at St Peter the Apostle Roman Catholic Church in Woolwich later today. Father Michael Branch, who will lead the service, encouraged people of all faiths to attend. "The doors to the church will be open to everyone, people of any faith or no faith,"
"It will be a call for us to go beyond our own faiths, to commit to reach out to other faiths and people of goodwill. "They'll be thoughts and prayers for Lee, his wife, son and family, and for all the guys in the armed forces, particularly in Woolwich barracks. "Together we can move forward positively and show there is absolutely no tolerance for intolerance." 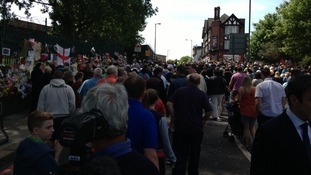 The service is due to start at the church in Woolwich New Road at 11:45 am. Touching tributes continued to be paid to Drummer Lee Rigby in Woolwich today, as the community stood united in condemning the soldier's brutal death. A steady stream of well-wishers added to the hundreds of flowers left at the corner of John Wilson Street, where the 25-year-old was hacked to death by two suspected terrorists. In one heartfelt tribute, a picture of Drummer Rigby with his son Jack was pinned to the railings, with the caption "Daddy and his little soldier! R.I.P Lee".